Promotional still from "Strange Brew" with Bob (left) and Doug McKenzie (right). Good day and welcome to the great white north. 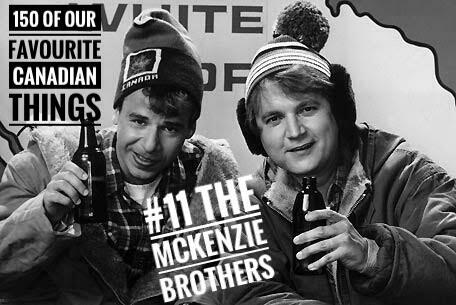 Bob and Doug McKenzie are fictional Canadian brothers who hosted the "Great White North" skit on SCTV. Known for wearing winter clothing all year round and drinking large amounts of beer. The brothers offered up good humour and impressive Canadian linguistics. So impressive that Canadians had no idea themselves that they used words such as "Eh", "Hoser", or my favourite "Take off". The brothers became very popular in the US and Canada producing many records and movies.